I’ve just finished a shawl for my other daughter (well I didn’t want her to feel left out!). 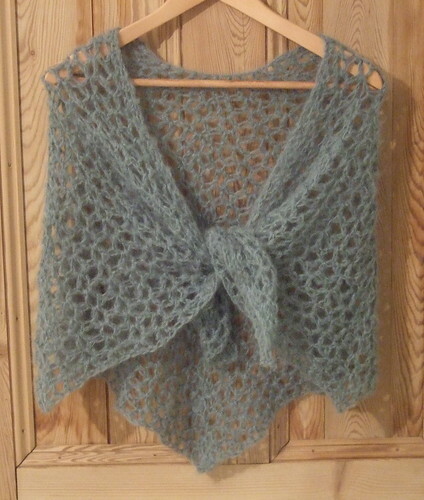 I mad this one with some left over Sirdar Blur, and it only took a few hours to finish. The pattern is available in the Free Patterns category in my sidebar. It’s another top down pattern, similar in shape to Eva’s shawl. It can also be worked with any yarn – I’ve also crocheted a sample in the same pattern with lace weight mohair and I think it works quite well. Not much knitting done recently. I did take the angora shrug to my local SnB group this week and managed to get a fair bit done. I’ve just started going to the group, and I’m really enjoying it. It’s a nice, active and varied group, and it’s great to get a chance to see and feel other people’s projects in real life. I just finished my first (of many, I am sure) Eva’s Shawl and it is absolutely beautiful! For the lace yarn, I used Art Yarn’s Shells on the Beach, just under 1,000 yards. This was my first time crocheting in lace and, while it was a bit challenging at first, the results are certainly worth it. This pattern is a keeper. I read all the feedback and Q&A back and forth, but the only resource that actually answered my questions was your close-up photo of the pattern. Thank you for being responsive to your fans. Correction to the above: I used CLAUDIA HAND PAINTED YARN, 100% silk lace, Shells on the Beach, a little under 1,000 yards, using the original Eva Shawl pattern. A total winner, and light enough for Summer here in Florida.